It’s one of Chicago’s most iconic, most visited, most historic structures. It’s been the scene of intense joy and, more often, intense heartbreak. It’s a landmark, and there’s only one other place like it left in the nation – make that the world. I’m referring to Wrigley Field, home of the Chicago Cubs. Often referred to as “The Friendly Confines,” Wrigley continues to draw fans – up to 3 million a year – to watch the Cubs play baseball 82 or so times annually. When the Cubs doesn’t make the playoffs (all too infrequent in recent years), the park has hosted a handful of rock concerts featuring long-standing acts that are household names. Here in the 2012 baseball season, Wrigley Field is the subject of controversy regarding the type of new development that will take place to keep the doors open and the crowds coming back. And, frankly, to keep the place structurally intact and to keep revenue flowing. First, full disclosure: I’m a life-long Cubs fan, having attended games at the old ball yard from the mid-1960s to the present. But rather than share thoughts on the future of the Cubs as a team, let’s focus on what may happen to the property at 1060 W. Addison St.
Wrigley Field is the second-oldest Major League ballpark in the nation, just a few years behind Fenway Park in Boston. It is built in a neighborhood that once was sleepy and quiet, but since the 1980s or so has evolved into a very desirable place to live and socialize. Frankly, the amenities at Wrigley are decidedly old-school, Spartan perhaps. Lights didn’t arrive until 1988, and the venerable, 75-year-old scoreboard is manually operated. The park dominates the Lakeview neighborhood so much that natives and visitors call the area Wrigleyville. The Chicago Cubs, owned since 2009 by the Ricketts family, have bold plans to bring the Wrigley Field up to modern standards, but serious questions remain regarding the financing. 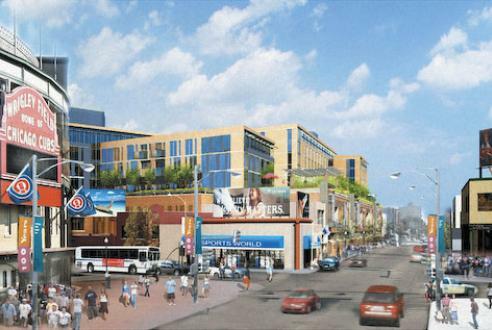 Land for new development is at a premium, but developers have proposed a hotel, apartment and retail complex at the southeast corner of Clark and Addison streets, directly across from Wrigley’s main gate. And, to use a baseball metaphor, Chicago Mayor Rahm Emanuel has thrown one high and inside by proposing to relax some of Wrigley’s landmark status. If enacted, the Cubs could add more modern features like large electronic scoreboards in the outfield bleachers and shut down surrounding thoroughfares on game days to create a so-called “carnival atmosphere” around the park. That already takes place in many regards. For years, the old brownstone and greystone apartment buildings along Waveland and Sheffield avenues across from the park have housed businesses where patrons can take in a game from the rooftops and enjoy food and drink on game days. So what should be done? For decades, some fans and non-fans have shouted loudly that Wrigley needs to be demolished and the team needs a modern stadium to compete in today’s big-business Major League Baseball. Others clamor with equal fervor to preserve and improve what’s become one of the game’s true museum pieces and a part of Chicago’s real estate and cultural history. Rest assured, the final pitch will not be thrown at Wrigley Field for at least a few seasons to come – no matter where the Cubs finish in the standings. We’ve all seen major sports facilities renovated before in Chicago, so what do you think should go into the next lineup: Rebuild and renovate the ballpark and neighborhood, or consider what many believe is the unthinkable and shut the park down? Let us know how you’d manage this late-inning situation. This entry was posted in Chicago News and Events and tagged 75-year-old scoreboard, apartment and retail complex at the southeast corner of Clark and Addison streets, “The Friendly Confines”, Chicago Cubs, Chicago Mayor Rahm Emanuel, Chicago’s real estate, developers have proposed a hotel, Fenway Park in Boston, final pitch will not be thrown at Wrigley Field, Lights, Major League Baseball, neighborhood, proposing to relax some of Wrigley’s landmark status, the Lakeview neighborhood, the property at 1060 W. Addison St, the Ricketts family have bold plans to bring the Wrigley Field up to modern standards, Wrigley continues to draw fans up to 3 million a year, Wrigley Field, Wrigley Field is the second-oldest Major League ballpark in the nation, Wrigley Field is the subject of controversy, Wrigley needs to be demolished and the team needs a modern stadium, Wrigleyville. Bookmark the permalink.